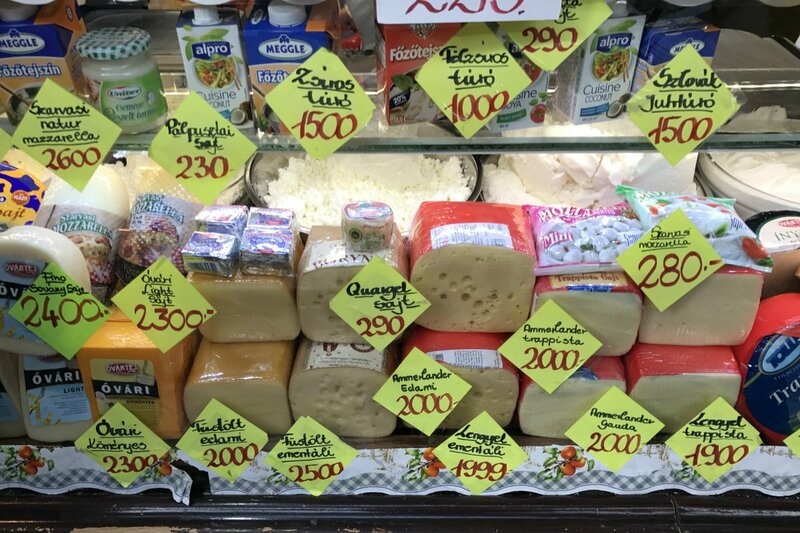 Cheeses on display at Lehel Market in Budapest. All photos by Jeremy Salamon. New York City chef Jeremy Salamon has been traveling to Hungary to visit family since childhood. On recent trips, he's made it his mission to further explore Hungarian culture and cuisine, seeking out new flavors to deliver to his guests at The Eddy, one of the few Hungarian-influenced restaurants in New York City. These are the places he goes to for inspiration and memorable meals. BUDAPEST — My fascination with Hungary began with my grandmother. Now 90 years old, Agi Salamon immigrated to the United States during World War II to escape the Nazi occupation. While I was growing up, she seemed very careful and guarded in talking about her past, but what she did chose to share with us was put on the dinner table. At just nine years old, I was accustomed to eating dishes such as goulash, paprikas, and palascinta. Hungarian food was my Sunday dinner diet, and I never thought to question it. Years later, the mystery of my grandmother’s goulash and stuffed cabbage has encouraged me to explore her past through my work as a chef and in my travels to her homeland. What follows are my favorite spots in Budapest and its neighboring regions. Some are well known, some are off the beaten path, some are an adventure to get to. But all of them will help give you a sense of the city’s culinary and cultural riches. This was the first place I went in Budapest (or specifically, in Pest, the eastern part of Budapest) that opened my eyes to Hungary. It's a bustling, four-story market full of food vendors selling everything from meat to traditional pastries. Lehel Market is where I first tried langos, savory Hungarian doughnuts made with riced potatoes and topped with a variety of garnishes. I remember stuffing my face with the fried bread hunched over a massive barrel of fermenting kraut. Langos have become a staple item on our menu at The Eddy, where we currently serve them with whipped goat cheese and Hungarian mangalitsa ham, among other toppings. When you touch down in Budapest, immediately run to Daubner pastry shop before closing. Order one of everything, especially their walnut-crusted dobos cakes and the tepertős pogácsa (pork crackling biscuits). The pastry shop has been around since the early 1900s and their pastry case seems to run a mile long. Depending on the day, you might have to wait in line — but you'll be so glad you did. This place may be as touristy as it gets, but it’s worth fighting the crowds for the opulent interiors alone. The cafe was a favorite gathering place for writers and editors in the early 19th century. After World War II, it was abandoned and turned into a variety of shops. Not until 2001 was it restored to serve its original purpose. Order a cappuccino and a tiered tasting of pastries. 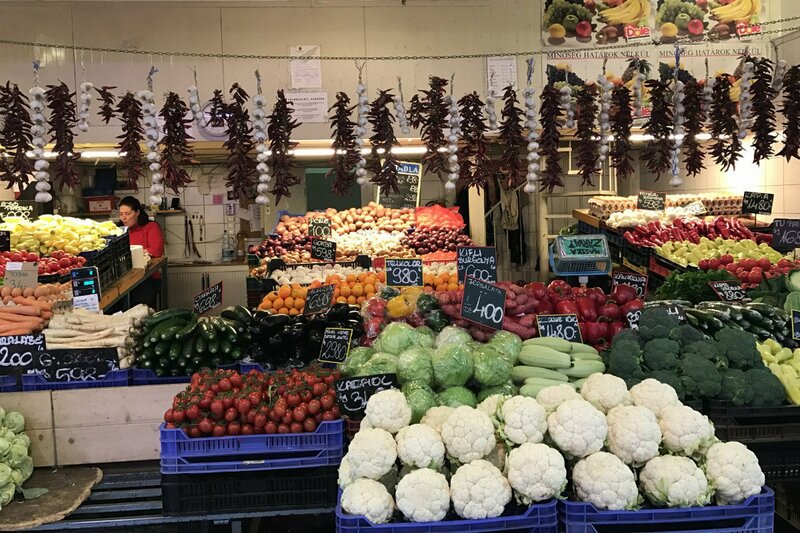 Colorful produce stalls at Lehel Market. Left: A barrel of fermenting kraut at Lehel Market. 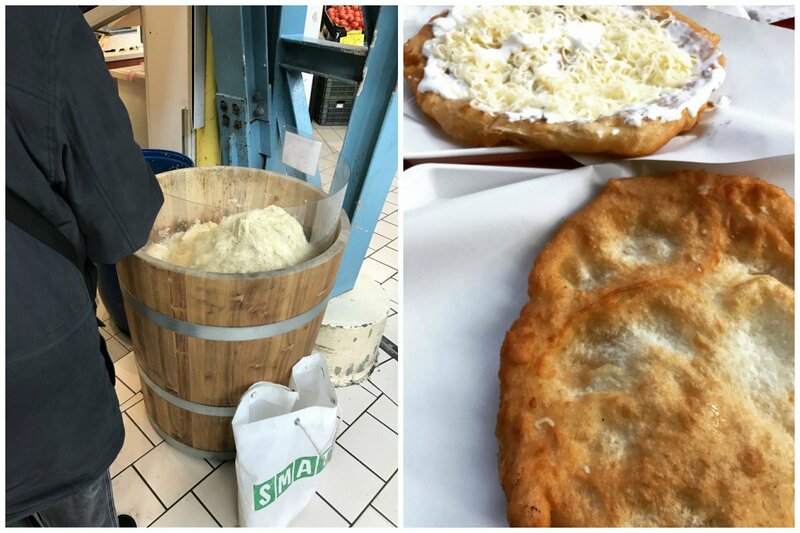 Right: Langos, the savory, deep-fried Hungarian donut. 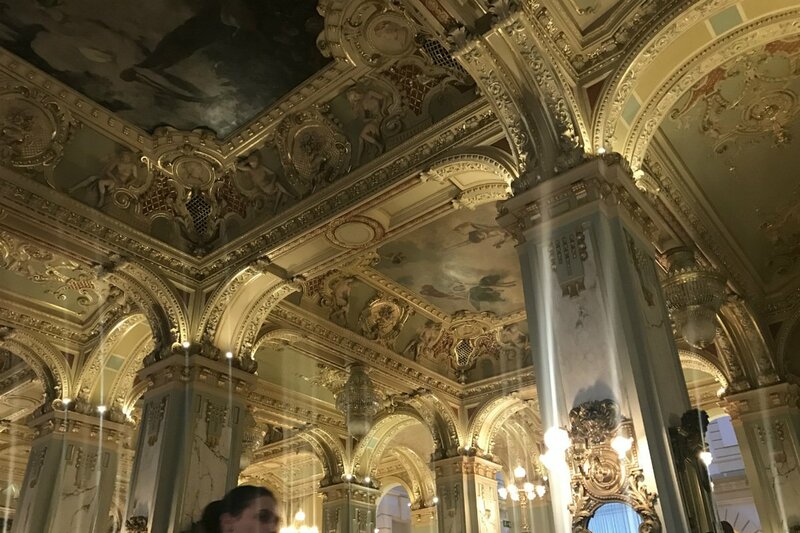 If you haven’t realized it yet, Hungarians are very into coffee and pastries, and Café Gerbeaud is a Budapest must. Intimate and luxurious in design, it’s hard not to fall in love here. The cafe is famous for zserbó szelet, or gerbeaud cake, layered with apricots and walnuts. One of my favorite pastries, it has inspired the desserts on The Eddy’s menu, where I like to stay true to famed Hungarian layered cakes like rigó jancsi or sacher torte. This fun and quirky restaurant serves a killer matzo ball soup, among other Jewish staples. It’s located in Budapest’s Jewish Quarter, blocks away from the iconic 19th-century Dohány Street Synagogue, the largest synagogue in Europe and second largest in the world. Stumbling upon this Jewish Quarter and its delicious matzo ball soup connected me back to the comfort dish I enjoyed in my own Jewish upbringing. Inside the opulent New York Cafe. 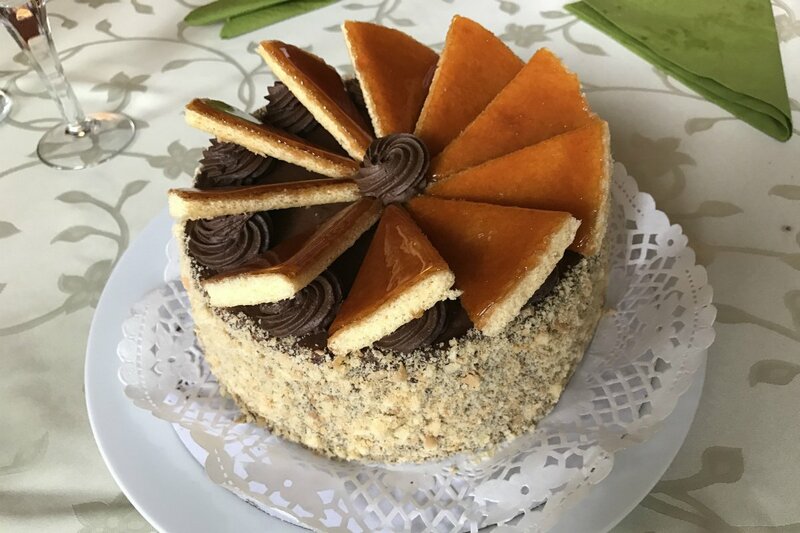 Dobos cake, a traditional spongecake layered with chocolate buttercream and topped with caramel, at Daubner. 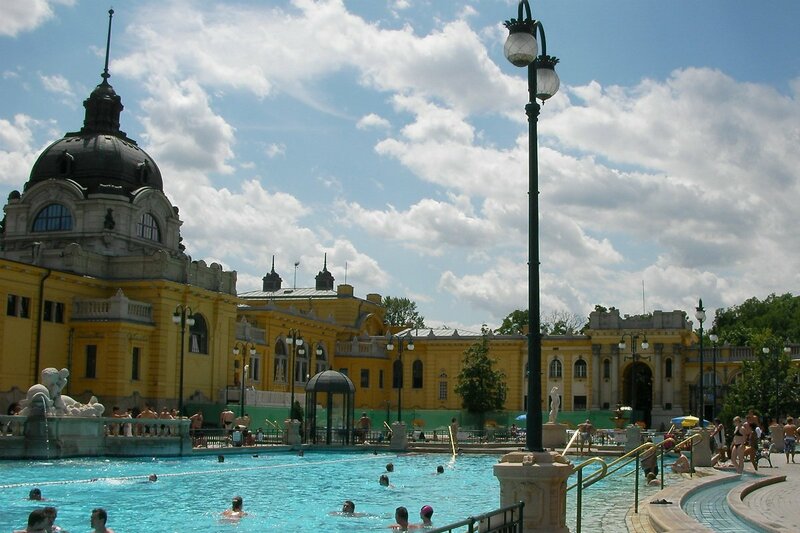 Budapest is famous for their bathhouses, and this one is particularly significant due to the international character of its guests. Whether or not it’s recognized as such, Hungary is a melting pot of various cultures, influenced by centuries of trade, war, and rulers. From what I’ve seen and heard from my relatives, everyone is welcomed here — every race, religion, and ethnicity. You will probably hear about a dozen different languages as you weave your way through the thermal pools. The architecture is also incredibly mesmerizing. Large marble statues of Poseidon and Aphrodite stand tall and occasionally spit water at guests. Located just north of Budapest next to a field of raspberries (and far from civilization), this cozy inn doubles as one of the best and most authentic Hungarian restaurants I've been to. Their palacsinta (stuffed crepes) are almost as good as my grandmother’s, and their porkolt (ham and bean stew) is the best I've ever had. I wash it all down with Dreher Classic, a local Hungarian beer. 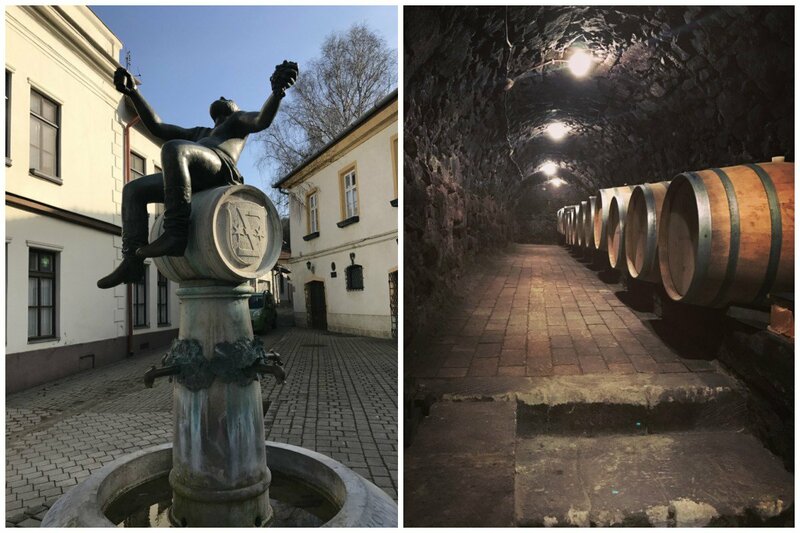 If you have access to a car, a day trip to the Tokaji wine region is a must. I visited during the off season in the winter, when the streets were so empty we could hear our feet echo on the cobblestones. Obviously, this meant one thing: more wine for me! It also meant more meaningful interactions with vineyard owners, which was absolutely the case at Himesudvar Winery. Situated on a hilltop, this 16th-century building houses incredible Tokaji varietals such as furmint, harslevelu, and sargamuskotaly. My cousins and I enjoyed not only a wine tasting, but also a private tour of the aging cellars led by the winemaker’s daughter. The enchantment of medieval wine cellars and Tokaji had me thinking of all ways I could cook with sweet Hungarian wine. The Széchenyi Thermal Bath, the largest thermal bath complex in Europe. Photo by Karen Blaha. A Tokaji fountain and a wine cellar at Himesudvar Winery. Jeremy Salamon is the executive chef of The Eddy in the East Village in NYC. You can follow him at @jeremycooks and @theeddynyc on Instagram. He travels for the love of food.